What to do in Berlin the first week of January? Read on for some great insider recommendations for free and low budget events and activities in Berlin. 1. For a great start in the new year and in the new week, we have our Free Dinner Party again, tonight! There´s going to be delicious food and friendly travellers to hang out with. It´s free of charge, so don´t hesitate. 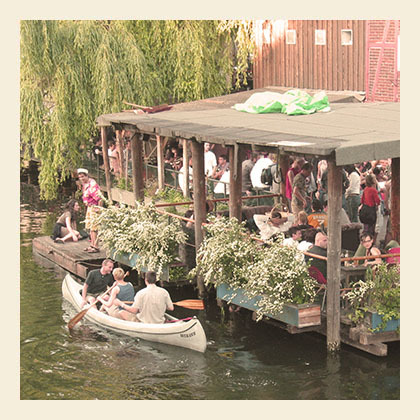 If your staying at the hostel meet up with us at 7pm in the lounge for another great evening of fun in Berlin! 2. Find out more about the Berlin Wall at the Berlin Wall Documentation Centre! It´s free of charge and within walking distance from our hostel. Opening hours- daily from 10am till 5 pm. 3. Go to the German Historical Museum, to see the exhibition: Strangers? Pictures of the other in Germany and France since 1871. 4. Pay a visit to the Sachsenhausen Memorial. Check here for adress and directions! Entry is FREE! But if you want to have a guided tour you pay a small amount of money. 5. White Trash Fast Food (number 9 at the back of our Flyer!)! Go here to eat great burgers and check out great rock´n´roll music. this friday Live: The Mokkers (garage/berlin), damage 6€. 6.Ooh it´s terribly cold in Berlin this week. So why not warm up a little at a sauna or a turkish bathing house. There is a nice hamam in kreuzberg, klick here for a link. It´s for women only! For a nice sauna closeby you could go to the olivin wellness sauna, at the schönhauser allee just around the corner from our hostel! 7.Organic Market on Kollwitzplatz, on thursday´s and saturdays! 8. Sunday Fleamarket day in Berlin. Go to the Mauerpark Fleamarket, not far from the EastSeven Berlin Hostel. It´s one of the biggest fleamarkets, and really exciting. There is a live open air karaoke show. For more information and insider recommendations, please ask our staff and check our online staff-recommendations! Hope to see you soon in Berlin!